Boulder City High School’s first-year girls soccer coach Arnold Oeland doesn’t see it possible for his girls to be shut out once again after narrowly missing the postseason a year ago. 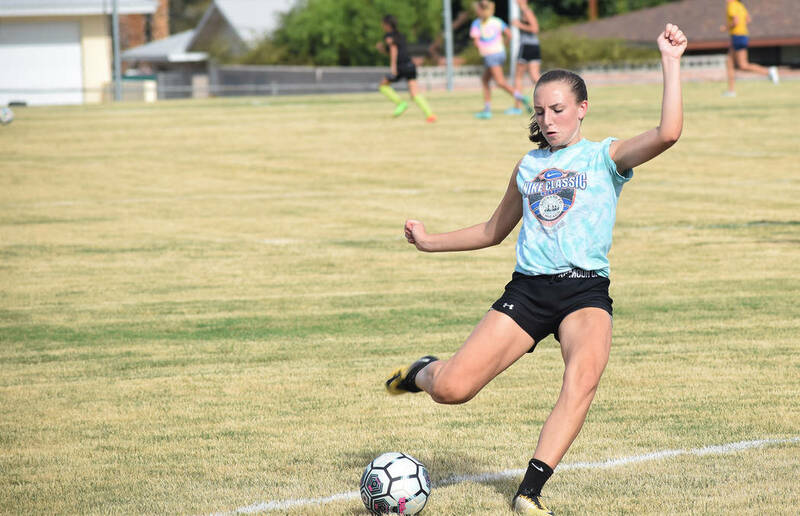 Robert Vendettoli/Boulder City Review Boulder City High School junior Madison Manns will lead the Lady Eagles soccer team this year. Last season, she scored a team-high nine goals with five assists. The Lady Eagles are led by junior Madison Manns, who scored a team-high nine goals with five assists last year. Looking to lend a helping hand on offense, junior captain Makenna Arboreen returns after scoring eight goals last year, while junior Trinity Oeland (one goal) and senior Lily Gibson are also expected to contribute. Oeland said he is excited about offensive player sophomore Sophia Legat, who has shown a knack for putting the ball in the back of the net this summer. Gibson and seniors Elizabeth Taggard and Malia Davis are expected to be a power trio for the Lady Eagles’ defense, while freshman goalie Quincy Gibson has been praised for making heads up play throughout the summer with her pumalike reflexes. Finishing 6-8-1 a season ago, the Lady Eagles will host 4A Eldorado in their home opener at 3 p.m. today. Returning 12 players from a season ago, including 10 starters, hopes are high for Boulder City High School boys soccer program. Sophomore striker Julian Balmer headlines the returning players for the Eagles, which ended last season with a 5-10-2 record. He lead the team with seven goals. The team’s last appearance in postseason play was 2013. Joining him on offense will be juniors Noah Dent and Mason Hood, who each generated four assists last season, and senior Caden Mendiola (one goal). Sophomore Brett Stewart is expected to be in the goal again this season after generating 1½ shutouts last season. The Eagles open their season Tuesday at Adelson School.